Autumn is finally here, and a lot of people are anxious about decorating their places in the right way. Luckily there are plenty of ideas that can help you decorate your house for autumn. Decorating your house with an autumn theme can start with bringing in new artwork. You can put up a nice painting that depicts the classic autumn colors such as orange and golden yellow on a prominent wall. This will immediately change the ambience of your place. Utilizing things that can give your house an autumn-like feel is essential. Using straw, pine cones, dried leaves, pumpkins, dried leaf vines and other such things can transform your home with a seasonal look. You can display such things on your porch or decking, for example you can have tall corn stalks on the front, orange ribbons wrapped around the porch columns and the mailbox etc. Garlands can bring autumn colors to your front door as well. But to make it more interesting with adding pine cones, berries and other such things to them. Make your dining table have an autumn feel as well. Add a center piece to it that has orange vegetables and fruits such as baby pumpkins, carrots, oranges and so on. Of course, with the topic of autumn decorations, the obvious question is how to decorate for Halloween and thanksgiving. As far as Halloween is concerned, the more frightening your house looks the better your party is going to be. Halloween is incomplete without the pumpkins, and the Jack-O-Lanterns surely give the Halloween decorations an air of spookiness. This time however do some big scale decorating. You are really going to attract a bunch of people by putting up a scene on your front lawn. 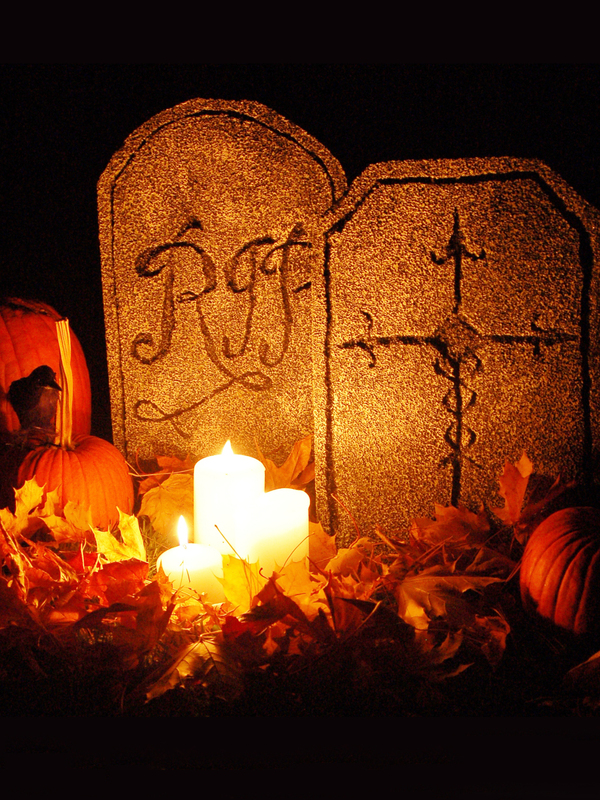 Put tombstones outside your house and create a scene of a skeleton pushing its way out of a creepy cemetery. This is of course just an example; you can create your own scene as well. Inside the house is where you can really give your guests goose bumps. Get online and go through the hundreds of things on sale that look scary enough even in pictures. As an example you can find a temporary and cheap wall papers that truly make a room scary. Remember to use your deck as an extension of your yard and/or house to really draw the holidays into and around your house while your company trickles through the rooms while mingling. While Thanksgiving elegance is just around the corner, you can still use a pumpkin to make your table more attractive. You can have a pumpkin with a nice wreath or flowers surrounding it or you can even turn the pumpkin into a vase and put flowers inside of it. Candles are great for decorating too. Find elegant and stylish one and have them at the middle of your table. Having floating candles inside beautiful bowl is a really good way to give your table a nice elegant touch. There are hundreds of design ideas all over the internet; the websites I use a lot for great holiday decorating is HGTV and Better Homes and Garden.